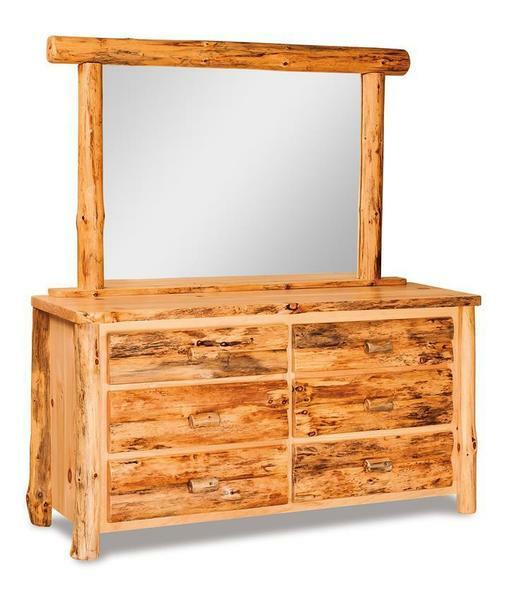 Bring some natural beauty into your bedroom with our rustic pine log dresser. This rustic log dresser is perfect for your cabin, lake house or rustic themed home. The raw edges and weather surfaces will make you feel at one with nature. With six large log drawers with slab fronts, you won't be short on storage space for your bedroom essentials. While rustic pine is the standard wood type for this dresser, we also offer the option to have it built in red cedar or aspen wood as well, to better match your dresser to other log wood furniture in the room. A large dresser mirror is also available and will be framed with the same log wood as the type you chose for the dresser. Please call with questions or custom ordering assistance on this Amish Rustic Pine dresser. Choose to order this unfinished, varnished, or stained and varnished for a custom look you will love.